Late last night we had gusty windstorm. We had been in bed for about an hour when we heard a noise somewhere between a big clunk and metallic thunk against/near the side of the house at the head of the bed. I assumed it was the slightly loose metal vent pipe getting pushed around – I even told John that’s what I thought it was. This morning I had the impulse to go check and see if the pipe should be tightened up somehow. Turns out I was wrong. It wasn’t the pipe. A 40-50 foot tree, dead for years, just on the other side of the property line in our neighbor’s yard, got blown over, toward our house. On the side right by our bedroom window and bed, AND the house propane tank. 1. If the tree had been just a FEW feet taller, it would have crashed though our bedroom window right over our sleeping heads. The top branch bent over to the left like it was reaching for it. As it was, only the topmost small branches scratched against the side of the house, just BELOW our window. 3. A branch off the central trunk, by the looks of it, had been sawed off many years ago. Had it NOT been sawed off, it would have come right down ON the tank. And yes – photos! 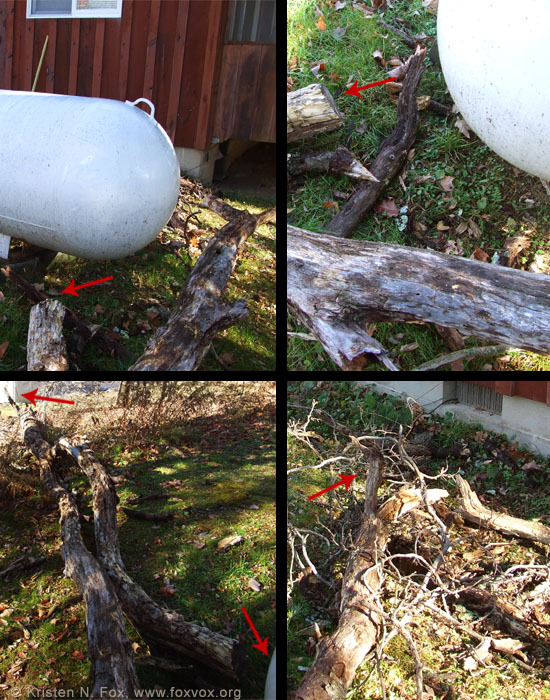 The arrows point to the sawed off branch, the top branches laying near the foundation of the house, and tree roots off in the distance (the white at the bottom right of that photo is the propane tank, for reference.) The window in the top left photo is our bedroom window. So – that happened! The tree was so dead and so dry/light that I’m not entire sure it would have done much damage to the propane tank itself, but it might have landed on the valves/connections on top. BUT….. I’m not a propane tank expert. On the plus side, I’ve seen a number of propane tanks destroyed in various ways on Mythbusters, so I know they are pretty tough – LOL. Mostly, I’m just crazy amazed at how exact that sawed off tree branch was, and the placement of the entire fallen tree itself had to be, in order for us to have no major damage as far as I can tell. (I was actually surprised that the tree didn’t go down in the last hurricane!) And now we don’t have that dead tree to worry about anymore. And…. whew! That was CLOSE!